That paltry hard drive can fill up fast, even on a computer built around cloud storage. Here's how to keep tabs on your space and make some needed room if you need it. Chromebooks are built for the cloud. As such, on-device local storage is frequently an afterthought, since you don’t need to download any software or other large files for offline storage. But there are often times when it’s convenient to save some photos offline or cache other work in case you find somewhere with paltry Internet coverage—and if you encounter just such a situation, the amount of space you’re given can get eaten up rather fast. Fortunately, Google has built in a couple of tools to manage your offline storage. Let’s look at where they are and the capabilities they offer, in case merely deleting old files from the Files app alone isn't enough for your needs. The first tool for you is kind of hidden in plain site. When you launch the Files app, head to the vertical, three-button menu at the top right. 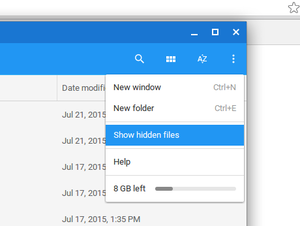 When you click that, you’ll see how much storage you have left on your Chromebok. Unfortunately, you can’t click it for a more full breakdown by file type, much the way you can on Windows or OS X. Check out your available storage from the file storage menu. Additionally, there’s a Show hidden files option that will reveal those small files that don’t show up in the usual view. These can be useful for if you’re troubleshooting performance on your Chromebook and need to see if there’s anything mysterious out there that could be impacting the stability or eating up too much space. There’s another spot out there for more advanced users to investigate if you want a more full picture of what's sitting on your Chromebook’s hard drive. If you type chrome://quota-internals into the Omnibox (read: Chrome's URL bar) you'll see more detailed statistics about the storage and other data residing on your Chrome OS device. From here you’ll see a list of different tabs. The Usage and Quota tab is where you want to look if there's a particular file you want to delete, or if you want the full, complete picture of exactly what is taking up storage on the Chromebook. 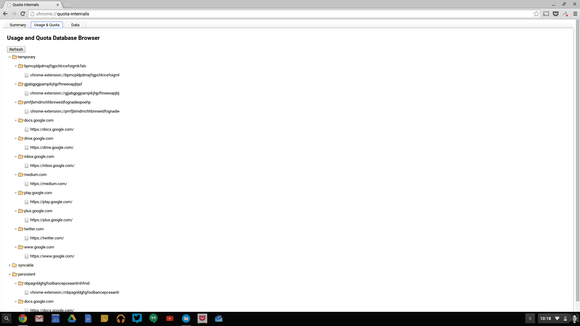 It’s not much to look at, but Chrome offers a useful method for managing your storage quota. You’re also able to see which sites have used your hard drive to store Internet files. If the browser seems slow or if you’re just curious about how companies are tracking your browsing, this is the place to look. 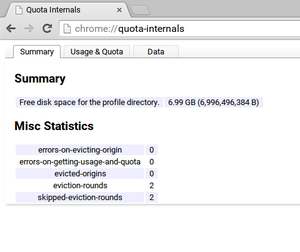 Get all the geeky statistics you want by checking out the Quota Internals page in Chrome. These tools should be enough to free up storage if you’re running low. However, if you find yourself regularly running out of storage space, it may be time to embrace some of the cloud-friendly programs and tools that make a Chromebook what it is—a powerful computer that offloads most of the heavy lifting to the cloud.